To offset the decline of its legacy video business, Comcast is developing a streaming offering. This transition will provide the company with extra synergies and growth potential. Comcast's full-year results (CMCSA - Get Report) obscure the contrast between the media conglomerate's declining legacy video business and its growth segments. And the acquisition of Europe's biggest pay-TV group Sky at the end of 2018 further blurs the picture. For instance, in 2018, Comcast reported revenue growth of 11.1% and operating growth of 5.5%. But Sky contributed almost 50% of that revenue growth. And more importantly, the video segment's revenues, which represented 23.8% of the total revenue in 2018, fell by 1.8%. The company is facing a secular decline of its video business, despite the lower-than-expected decrease during Q4. The video segment lost 344,000 residential subscribers during 2018. By contrast, several other businesses more than offset the decline of the video segment. High-speed internet, business services, and advertising grew by 9.3%, 10.7%, and 14.1%, respectively. Together, these growing areas exceed the video segment's revenue. Also, NBCUniversal, Comcast's media and entertainment segment, grew its revenue by 8.9%. With this context, management announced the launch of a streaming service by the first half of 2020. The goal is to offset the impact of the cord-cutting momentum and capture growth. Despite the decline of the important video business, this forced transition will have some positive impact. 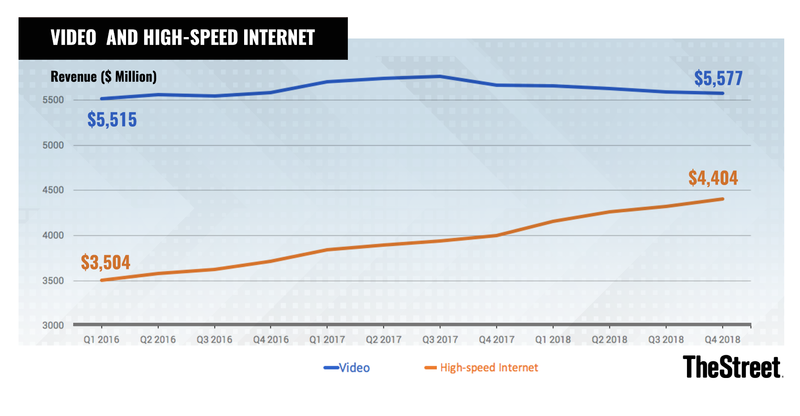 Consuming video over the Internet will increase the need for high-speed Internet connectivity. Video requires high-bandwidth and stable Internet access. And with the development of high-definition video, these qualities become even more important. The high-speed internet Comcast offers will benefit from this extra demand. And due to the fixed-cost nature of the cable infrastructure, this growth will improve margins as well. The threat posed by 5G, which is starting to be deployed, to fixed wireless internet, is overestimated. Unlocking the full potential of 5G requires the deployment of antennas near the subscribers' houses, which implies important infrastructure costs to cover a vast territory. And the competitiveness of 5G versus cable in terms of price, performance and traffic volume limitations remains to be seen. The other benefit from the shift to the streaming video for Comcast will come from the more targeted audience for its advertising business. In contrast to the legacy video technology, the company will have the possibility to gather more information about the viewers with an online solution. Thus, Comcast will be in a position to develop the advertising segment towards the higher margin targeted advertising activities. As an illustration, NCC, a marketing company Comcast partly owns, recently announced the extension of the legacy TV advertising footprint into the online world. The benefits of the new streaming service for Comcast's other businesses explains why management will propose this offer to the subscribers at no extra costs and with light advertising. Contrary to Netflix, the streaming offering will generate synergies with the other Comcast's activities. Besides the benefits for the high-speed Internet and the targeted advertising, the company will take advantage of its NBCUniversal business to provide unique content. Also, the free streaming for video subscribers will help to slow the decline in its legacy video customers. And the Sky acquisition brings scale against fixed costs to improve margins. 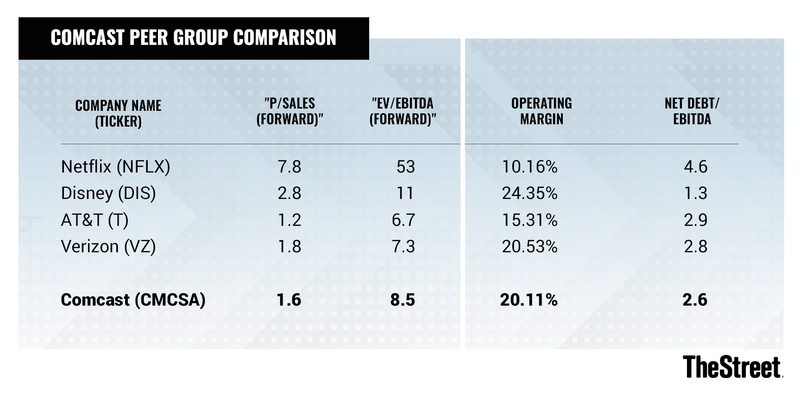 With P/Sales (forward) and EV/EBITDA (forward) ratios at about 1.6 and 8.5, Comcast's valuation is reasonable, considering the potential of the businesses. But because Comcast is a conglomerate, valuation comparisons must be taken with a grain of salt. For instance, Disney (DIS - Get Report) and Netflix (NFLX - Get Report) don't sell internet access. But the table below shows Comcast's valuation is in line with its competitors in the internet provider space. At a current stock price of about $40, the market doesn't offer an important enough margin of safety to justify a buy right now. But Comcast makes sense for long-term shareholders to hold as management executes on its strategy. Comcast and Disney are holdings in Jim Cramer's Action Alerts PLUS Charitable Trust Portfolio. Want to be alerted before Cramer buys or sells CMCSA or DIS? Learn more now. The author doesn't own any of the stocks mentioned in this story.